The Tourist is a mystery, but not a very good one. It’s too convoluted, and actually had potential if the script simply provided the information it needed to. This is the type of thing difficult to discuss without divulging spoilers, but rest assured that if Tourist had a certain intention for a meeting between Johnny Depp and Angelina Jolie on the train, it all makes sense. Besides, if it doesn’t go that way, the whole thing is just a giant plot hole, and an excuse for putting Jolie in a bunch of glamorous clothes while she walks towards the camera seductively. On top of that, the film merely appears larger in scale and scope than it actually is; that’s what Venice can do for a film. In reality, it comes down to a handful of characters, four people somehow intertwined as the film slowly reveals who they are and what they’re doing. There’s also the matter of an outstanding person, someone in on the whole thing, but is never seen. Unraveling who it is, well, that’s supposed to be the fun, yet Tourist doesn’t seem to have a clue what to do with any of this. The film is simply all over the place, jumping in tone, style, and pacing with almost zero regard to the audience’s needs. It begins with it a brooding mystery, a sultry woman being tracked by some form of British police. There’s a matter of a burning paper and what the message contained within means. It starts with a great vibe, and the score contains majesty and respect for the location. Then it squanders it all, inserting a summer blockbuster style of humor that never feels right. Tourist also expects an audience to buy that Johnny Depp can play math teacher from Wisconsin, and no matter how they dress him or downplay his star status, he’s still Johnny Depp. He’s too suave, too slick, and too eager to go along with the events unfolding around him too. The character feels like its been written to toy with the audience, and in the end, maybe that was the intent. If everything was revealed early without this nonsensical attempt at intrigue, Tourist might have been something. Sony’s AVC encode for this expensive bit of jumpy cinema only looks the part because of the location. In terms of definition, this one is all over the place, moving from a highly detailed scene to another that looks intentionally filtered. Venice aerials are always stunning, the roofs always defined and the architecture given full respect. When discussing close-ups and other interiors, all of that tends to get tossed to the wayside. One of the earliest Jolie close-ups at the cafe seems to be setting a high standard, and then once onto the train, things begin to crumble. Medium shots appear soft, lackluster, and even a bit smoothed over. The rather ugly digital intermediate work doesn’t do it any favors either, especially the gaudy orange flesh tones blasted with teal clothing and backdrops. You simply have to adore the police computers that apparently don’t use color screens; they’ll all draped with blues and teals. There are few other primaries allowed to escape, most of the wardrobe choices going for black or white. Some of the exteriors of the train passing by landscapes allow for green to seep in, but that’s the extent of this limited, and quite frankly ugly palette. Black levels follow the mold left by everything else, one moment extraordinarily deep and dimensional, the next floundering as they’re asked to come into play. They’re simply awful as Depp is first taken into custody and tossed into a cell, while during the finale they excel. Certain shots of snipers on scene, dressed of course in black, against a nighttime sky are superb. The inconsistencies are rather baffling. The film stock carries a light layer of natural, well resolved grain. There is one instance of rather drastic damage for a brand new film, a scratch at 29:42 across the opening door of the plane. It’s quick, but severe. Otherwise, the source is perfect. The transfer is free of other abnormalities as well, from aliasing (impressive considering the strict lines of Venice) to banding. Tourist is not an audio tour de force, although it does have its brief flashes of brilliance. The surrounds are adventurous when it comes to gunfire during a boat chase sequence, shots fired off in just about every channel once things get underway. As the boat crashes, the subwoofer gets involved too, the sound adequate for the vehicle thumping into another. There are other little things the DTS-HD mix does well, including glass shattering quite distinctly in the rears at 1:30:40, to a minor explosion just a few minutes later. Ambiance isn’t rich, but effective where need be, including the train station after the opening sequence concludes. Dialogue is well prioritized, clear, and free of any fidelity faults. Director Florian Henckel von Donnersmarck provides a solo commentary, followed by a behind-the-scenes bit about shooting in the canal. 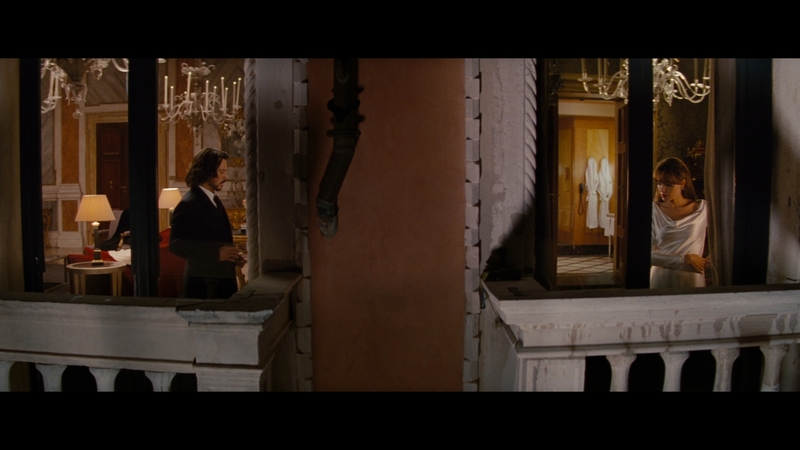 A Gala Affair looks at the extravagant event sequence late in the movie, while Action in Venice dives into the choreography of the film’s more upbeat passages. Bringing Glamor Back is all about style and Tourist Destination might as well be a PSA about Venice. An alternate title sequence, terrible outtake reel (which is mostly an interview), trailers, Movie IQ, and BD-Live are left.